Yesterday afternoon, Blackburnian went down to the dock to check on the tarp over the boat, as it had been raining for a bit and we were concerned that the batteries that power the little electric motor might have been exposed. They weren’t, but when he pulled back the tarp from the front he exposed this spider and her nest. It’s a dock spider, probably Dolomedes scriptus, a relatively common species. We’d noticed a little dock spider hanging about our dock over the last week. 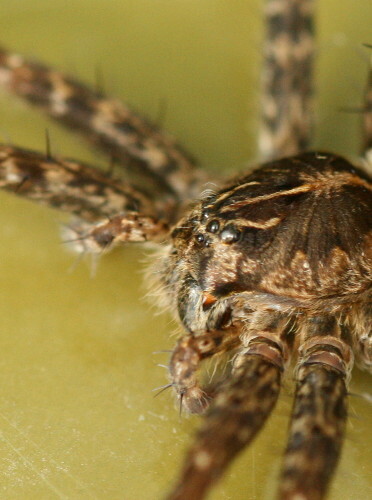 I use the word “little” in the relative sense – full-grown dock spiders are anything but little. Because of their preference for water, they are often found in association with cottages, which generally have a lot of water around. Cottages also have more people around than the average pond or stream in the woods, so the spiders are more likely to be observed. I tend to think of them as northern “cottage country” species as a result, but they are found through much of eastern North America. 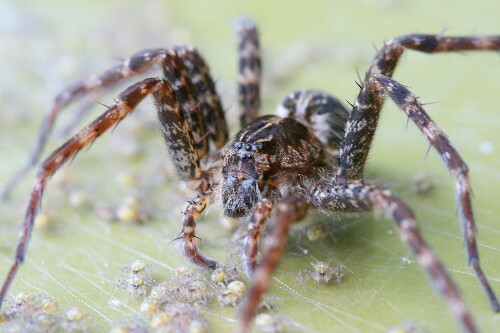 The group of spiders are also known by a couple of other names: “Fishing spider”, which usually refers to members of the genus Dolomedes, or “Nursery web spider”, for the family Pisauridae. The name dock spider is obvious in its origin. Dolomedes get the name fishing spider because the spiders prey on water organisms, often water striders, but also take small minnows and tadpoles, and anything else unlucky enough to pass their way, from the water. They either lie in wait in a location above the water (such as on the dock), or they’ll stand on the water themselves, using the same mechanism as water striders to avoid being pulled under the surface. When suspended above the water they must rely on their eyesight, but by standing on the water they can use the water’s surface as a very large web and detect the vibrations of potential food sources. 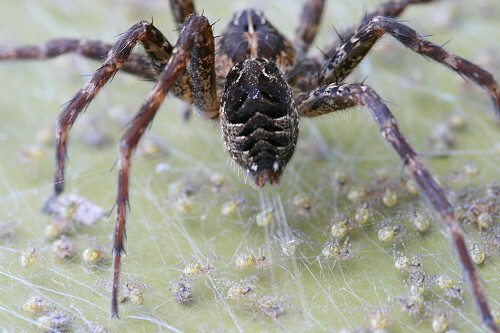 The name nursery web spiders, on the other hand, comes from the parental care the spiders invest in their eggs. The female will carry the egg sac around in her chelicerae (the fang-like things at the front of her mouth) until they’re nearly ready to hatch. Then she’ll affix it somewhere and build thread over the sac. 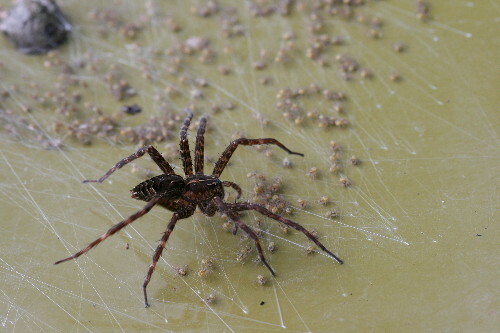 The web provides protection to the young spiderlings, as well as a substrate for them to climb on. 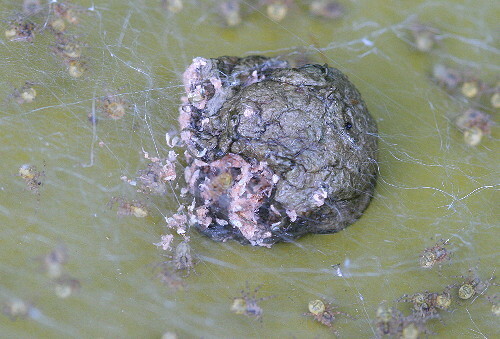 The adult will guard the nest until the spiderlings leave about a week later. 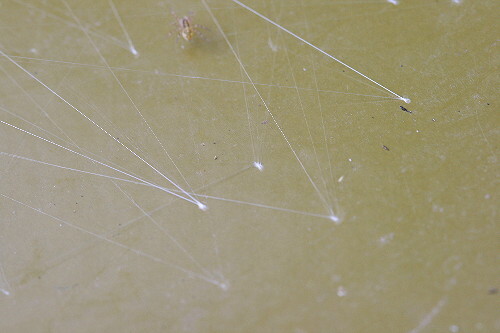 The spiderlings usually hatch within 24 hours of being affixed to a surface. We discovered this firsthand, since we’d taken the boat out the night before, and when Blackburnian returned the following afternoon there was the family of spiders. He called me down to have a look. 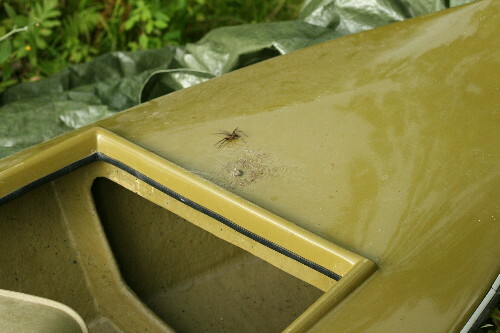 We have to assume that the spider had crawled into the crumpled tarp while we were out, and then was on the underside when the tarp was spread over the boat again, but she could also have got there on her own volition, since the boat pulls up right next to the dock. The female seemed, for the most part, unconcerned with my observation. Rather, she was preoccupied with fortifying the web she’d built for the spiderlings. I watched her for a little bit as she did this. She’d walk across the web trailing silk from her spinnerets. It wasn’t a single strand, like I would expect, however, but rather a fan of silk that spread out across a greater area. Much faster! When she got to the edge of the nest she would affix the silk to the substrate, in this case the boat hull. I assume the glue is the same thing that makes the webs sticky, but perhaps concentrated, and also purposefully pressed onto the surface. This photo makes it look like there’s only three lines coming into each point, but there was more than that. The little spiders are teensy tiny when nthey hatch, only a few millimeters, and are yellowish instead of the dark brown of their parent.. 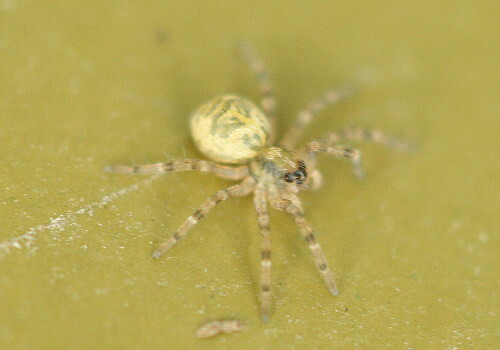 They remain in the webbing for their first week of life, then disperse off on their own. While their mother is usually not far away, the spiderlings also respond to potential danger by huddling up into a mass (based on the premise of safety in numbers). We took the boat out again today, and weren’t sure what to do about the spiders. Eventually we decided to remove the adult, who could potentially bite if I got too close (I didn’t know, but didn’t want to take chances, either), but leave the spiderlings in their web. They seemed to deal with the experience just fine; the boat doesn’t go very fast, so they were never in wind they couldn’t hang on in. At points I noticed they’d huddle up along the rear edge of the nest, but generally they were about and moving around. Sounds like the basis for Disney’s next heartwarming feature-length. I bet they’d even out the proportions between Mom and her kids, though, so the babies didn’t look like underweight Timbits beside her. I’ve enjoyed the chronological nature of your last two subjects. Great shots, and so interesting. I didn’t know they could spin multiple strands, but it makes sense given the web type. Do they bite? I’ve had serious bite on lips for 3 months and I found one in bathroom. Goes with steroids but comes back.